Friedrich August KEKULE, later Kekulé von Stradonitz. Born: Darmstadt, Germany, 7th September 1829. Died: Bonn, 13th July 1896.
the study of reaction products can give information about structure. Kekulé did not develop his structure theory, with the sole and spectacular exception of his solution to the problem of the structure of benzene (1865). 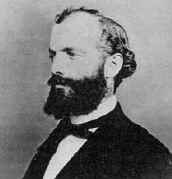 Kekulé never finished his major work, Lehrbuch der Organischen Chemie (1859 onwards), but it was influential in spreading his ideas. Kekulé was married firstly in 1862, but his wife died in childbirth. In 1876 he married again, unhappily, though had three more children despite in the same year suffering an attack of measles that affected his health for the remainder of his life. He produced no significant work after about 1876.